There are many days that I believe that I live in an alternate reality to the rest of the people on this planet. I desperately attempt to embrace truth where it seems like so many individuals in the world are running to escape from it. Several weeks ago, the NY Times ran a front page article on a South Dakota issue regarding a pending bill to restrict transgender children from using boys or girls bathrooms, i.e. schools would have to provide separate accommodations. (The bill was vetoed by the governor on March 2, citing his reasoning as a civil rights violation.) So there is a major outcry that we are violating the civil rights of the transgender children. Forgive me for being small-minded, but why do the rights of the transgender child supersede the rights of the other children to feel comfortable in an environment? Why is it necessary to force this issue down the throats of ten or eleven year olds that cannot begin to understand the issue, but feel angst when a transgender child comes into the bathroom and would rather leave than use the facility? This is not an issue of equality of race or gender, but rather an issue of truth and common sense! Last week, Iowa passed a bill to allow children under 14 years of age to use pistols and handguns. The NRA celebrates, while the families of the victims of this insane legislation will be in mourning. 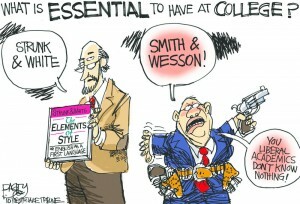 This goes right along with the Texas legislation as of August 1, 2016 that allows students to carry concealed, loaded weapons on college campuses. God help the professor who gives a student an F! Dueling pistols at dawn on campus when two guys are fighting over the same girl! We have a presidential election where, as a responsible citizen, I exercise my right to vote every year. So our despicable two-party system puts forth two candidates providing more ridiculous behavior than John Belushi and Roseanne Barr combined. The United States has become a total global embarrassment. There is a high probability that Donald Trump began this entire campaign on a lark. Then he woke up one day and realized that the unwashed American public was actually embracing his rhetoric and he could really win. And then there is Hillary, running on the fact that she would be the first “female” president, breaking the presidential glass ceiling. Sadly, being a female may be her only positive credential, countering her ineptitude in “travelgate” to her possible indictment for e-mail stupidity or for fraudulent use of funds by the Clinton Foundation. Then there is American Idol 2016, the final season. There are six contestants left, all with talent, none of them comparable to the all-time greats, e.g. Kelly Clarkson; Carrie Underwood. There is Dalton Rappatoni, punk-rocker, who will garner the majority of votes from teenage girls without a doubt. There is Tristan McIntosh, a beautiful 15 year old with a wonderful heartwarming story, i.e. her mother serves overseas in the military and was brought here for the competition. There is McKenzie Bourg, a talented young folk singer, song writer, who is extremely affable and will definitely cut records some day. There is Sonika Vaid, a lovely 20 year old Indian girl, with the best pure voice in the competition, whose rendition of “Bring Me to Life” by Evanescense was probably the best performance in the competition to date. There is Trent Harmon, whose performances are a bit over the top, but appears to be the J-Lo male favorite. What is truly annoying is that the judges have been promoting the final performer, La’Porsha Renae, ad nauseam. They have declared her the “diva” each week, and never critique anything about her performances. “She has been anointed”! She does have one minor flaw, which no one is permitted to state because it is offensive, not politically correct, but nevertheless true. She is the size of a miniature version of the “Hindenberg”. So while her performances are solid, she is not an entertainer that is visually appealing and her marketing value might be compromised. However, unless the American public repudiates the judges and decides to vote independently, and with the assumption that the results are untainted, La’Porsha may very well be the final American Idol. Let’s hope that Stephen Hawking’s string theory is correct and that there are other dimensions and alternate realities. Maybe there is one with a little less insanity, more fun, and better presidential candidates.